The newest Tough model draws on Olympus’ extensive history of creating rugged, durable cameras that take the worry out of life-on-the-go shooting. This revolutionary TOUGH model introduces the World’s First Ultra-Bright, High-Speed f2.0 lens on a Tough camera allowing you to capture dramatically better images in low-light and fast action situations than any other rugged model currently on the market*. The combination of durability and outstanding image quality makes it possible to shoot in even the harshest of conditions. Just imagine: capture beautiful underwater scenes and aquatic life, snap photos of triumphant arrivals to dusk-lit peaks, record your ride down the rapids in dazzling 1080p Full HD Video. The possibilities are truly endless. This 3.0”, high-resolution OLED display (610K dots) provides excellent visibility outdoors enabling you to compose the perfect shot even in direct sunlight. And several protective coatings help to prevent scratches and cut down on reflective glare from bright lights and sun. Awesome optics, both in camera and on screen. 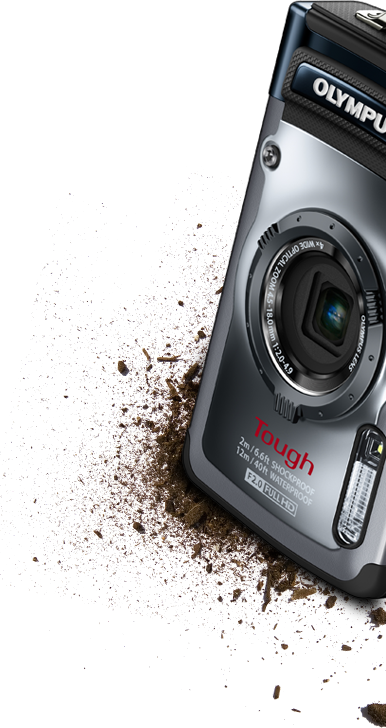 The TG-1 iHS crushes the notion that cameras are easily damaged by water and humidity. The Olympus-original complete sealing system and double lock construction borrowed from Olympus’ long history of manufacturing underwater housings ensures that the TG-1 iHS is completely waterproof down to a new depth of 40ft. Even on land, the TG-1 iHS ensures that you’ll never miss an awesome shot just because of heavy rain or snow. The TG-1 iHS uses a double-layer construction, consisting of a tough yet lightweight polycarbonate resin and a metal frame. The crushproof construction ensures that your camera – and screen! – won’t break, even under 220lbs of pressure. No more cracked screens because you’ve left your camera in your back pocket or suitcase. Keep shooting outdoors even in the winter. The TG-1 iHS is designed to keep operating at below freezing temperatures, safe from the two most common problems when shooting in cold weather: lens condensation and auto zoom malfunction. Hit the slopes, fire up your snowmobile, or break out the skates, because with the TG-820 iHS by your side, you’ll never miss those awesome wipe out moments. Splash after splash, never worry about water droplets obstructing your images thanks to the water-repellent lens coating that prevents water from remaining on the lens surface. And because it’s applied to the OLED monitor as well, composing shots in the rain or while riding the waves will be a breeze. A high-sensitivity, high-speed 12-megapixel backlit CMOS sensor combines with a blazing fast, DSLR-quality TruePic™ VI image processor resulting in high-speed autofocus, enhanced Intelligent Auto for spectacular scene and subject recognition, and 2x Super-Resolution Zoom to produce jaw-dropping images in locations that make even the most seasoned photographers cringe. This family of technologies conquers challenging shooting conditions with improved light condensing efficiency, less noise and quick response time – twice as fast as traditional cameras – for definitively unmatched image quality. Designed specifically to keep up with life-on-the-go photography, the new Super Sport Mode combines high-speed autofocus with extra fast shutter speeds – up to 1/2000 – to freeze the action. Conveniently located on the dial, this mode captures 5 shots in a high-speed burst to ensure crisp shots of even the most extreme action sport settings. Low Light Mode is perfect for capturing the mood of low-light indoor scenes, beautiful sunsets, or late night outdoor festivities without ruining the ambience with a bright flash. Forget about subject blurring or camera shake ruining the shot – Low Light Mode has you covered. With the TG-1 iHS, you can shoot 1080p Full HD videos (1920x1080 pixels) at the touch of button, allowing for slow-motion playback. Thanks to iHS Technology, your videos will get the VIP treatment with excellent color reproduction and faster processing speeds, while Multi-Motion IS compensates for user movement creating smoother videos. Linear PCM Recording, an audio technology pioneered by Olympus for professional voice recorders, records your videos with high-definition audio for optimal playback results. HDMI output and control makes playing back videos on your HDTV a breeze. Shoot like a pro! With 10fps high-speed burst shooting, nail the perfect shot by taking a quick sequence of images at the touch of a button. Still afraid you’ll miss a moment? At 3MP, the frame rate increases to an astounding 60 shots per second. You’ll have so many great shots, you won’t be able to share just one! In iAuto mode, the camera automatically detects the subject, lighting and situation to identify the scene you’re shooting – up to 30 different scenes including Night, Sport, Beach and Snow, Underwater Snapshot and Backlight HDR – and adjusts the settings for ideal results. Leave it up to the TG-1 iHS to choose optimum settings so you can focus on capturing that amazing shot. functionality to a whole new level. Achieve panoramic wide-angle shots without sacrificing the brightness of the f2.0 lens. Even in darker underwater scenes down to 65ft., you can shoot wider, more dynamic images that beautifully reproduce underwater scenery. Waterproof to 65ft. Telephotography of 1.7x extends your optical zoom from 4x to nearly 7x. Get highly artistic shots that draw attention to the subject by blurring the background, and achieve higher shutter speeds while zooming in close on a subject on the move. Waterproof to 65ft. Don’t forget the adapter for your Fisheye or Tele Converter Lens! Already have a stash of favorite lens filters? The converter adapter can accommodate any 45mm filter. The ideal travel guide. With the GPS and e.compass functions on the TG-1 iHS, location and landmark information will be displayed and recorded along with the image. The TG-1 iHS is also equipped with a logging function so you can track the route taken from recorded images by using applications such as Google Earth and Picasa. And with the brand new LI-90 battery, you’ll worry less about battery life and more about your next destination. An LED Illuminator is like a mini-flashlight on the front of the camera to enhance focus and exposure for macro shooting – great for underwater close-ups where light is scarce. The LED illuminator also works in conjunction with the flash to help illuminate your subject in low-light conditions. I bought this camera back in 2012 and the quality of pictures/videos it delivers up until now looks great. I had this through my snow trip in Seoul, spring trip in Japan, summer trip in Dubai and everywhere in between. I took this on my mountain climb activity and despite rain, cold and dew its proves its sturdy claim. Underwater, no leakages so far, took it while doing whale shark and dolphin interaction in the Philippines recently. I could say, this camera is worth every dollar I bought it with with all the abuse and adventure it endured. Good for concerts low light function is great. The ring lens falls off easily when I did spelunking, I had to buy an replacement when I went to Hong Kong. Planning on updating to TG-4 this year, my old unit is in dire need of rest. After years of torture in my hands, the function dials are acting up and the zoom functions sometimes stuck. But overall, I'm giving this camera two thumbs up. I love this camera. Its everything they say it is. TOUGH! One thing they could work on is making the decorative ring around the lens to screw on tighter. Its removable so that you can add other lenses, but mine kept coming loose and I finally lost it. Had to order another one online. My camera is black, but I ordered a red ring so that I can see that it is on the camera at all times. Kinda gives it a cool look with the red ring in the middle. Have this for 1 year till got tilt, while on vacation. I returned it and they couldnt fix it. I received a new one instead. I love thiscamera so much, take great pics great resolution, and best of all its water proof and shock proof. I purchased the Tough TG-1 iHS in August 2012. . I was drawn to this set up as it can be used under water, in snow, ice, rain, sun, and just about any weather condition you can imagine. I do own several cameras which include models for use under water with a separate housing. The TG-1 is phenomenal as there is no separate housing to purchase or use in the water or inclement weather. I also use this set up for taking photos at concerts (between the front row seats and the quality of the speed, lens and all of the TG-1) I can't go wrong. The shots I have obtained of performers on stage with the zoom as well as the two optional lenses I picked up for this camera I could not ask for a better picture or results. I am so impressed with this camera!! I actually did drop this one onto marble floor tiles from about five feet.....no damage whatsoever in the body of the guts, lens, etc. It was amazing. That would have been the death of any other camera out there. The only accessory I "need" is a lens cap for the body's lens....lost one at a concert and I don't see any available at all for this TG-1. I'm now using the cap from one of my extra lenses for the TG-1 but I would prefer to have protection for all of the lenses on this camera. I can't rave enough about this camera. The one thing I had to adjust to is the audio pickups are on the top of the camera where I tend to place my fingers to line up my shots. I try to remember to place my fingers "properly" while shooting video with this one. I can't say enough great things about this set up. If you are "thinking" about buying a set up like this look no further!!! I am having so much fun with the TG-1!! 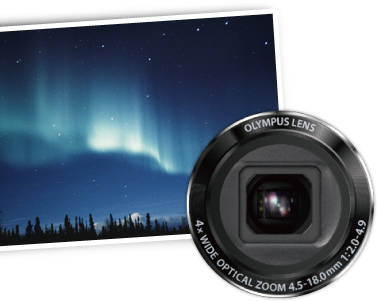 Thank you, Olympus! (I also have an Olympus E Volt 500 SLR, Nikons...film and digital and Canons, too). I LOVE this TG-1!! The camera worked for about 3 days and then would no longer turn on. Returned it 3 times for repairs and each time it came back with different problems.